As summer draws to a close, we’ve a few garden appliance storage tips for the months ahead. If you love being super organised and expertly prepared then getting your garden appliances cleaned, checked over and stored away will give you a head start next year and prevent any potential problems. It might seem like a bit of a hassle, but you will definitely appreciate it next year when the first sight of sunshine has you racing to get in to the garden. Tidying up the lawn is often the first port of call when spring hits, so you will want your mower in top condition and ready to go – which starts with how it’s stored. Firstly, you should check all the key components are not damaged before you tuck it away in the shed or garage for the winter. 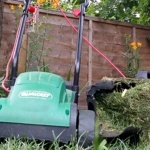 Lawnmower blades can easily become blunt, bent or damaged following a whole garden season’s worth of cuts and this will definitely affect the cleanness of the cut in the future. The first cut of the new season plays a vital role in maintaining a healthy lawn, so after inspection if your blades are looking a little worn out then replacing them or purchasing a back up set will ensure you regain control of your lawn as soon as the weather is good enough. A tip for avoiding your lawnmower blades getting damaged unnecessarily is to always check the lawn for stones before you start to mow. If you use a petrol lawnmower then it is crucial that you remove any excess petrol from the tank before you store it away. The reason for doing this is that stored petrol can degrade and it turns to a varnish-like substance, becoming ineffective. If you have ever got the petrol mower out of the shed after the winter and pulled the starter only to be greeted by barely a splutter then more often than not it’ll be old petrol causing the problem. Trimmer line degrades over time and as consequence it becomes more prone to line breakages. Most of the leading manufacturers suggest replacing the line at least once in the season. 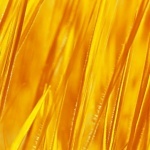 Before you store the trimmer away consider discarding of the old line and purchasing a replacement. Although you will be storing some garden appliances, the autumn is also a time of year when some garden appliances come into their own. 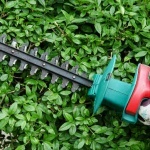 These include items like leaf blowers to help keep your garden tidy. Remember you can buy any spares or accessories you need for garden appliances at eSpares.